Disclosure: This is a sponsored post on behalf of The First Years; all opinions expressed are my own. Ahhh the struggles of getting kids to eat! I've gone to educational sessions, read books and commiserated with fellow parents over the challenges that have plagued parenthood for eons. 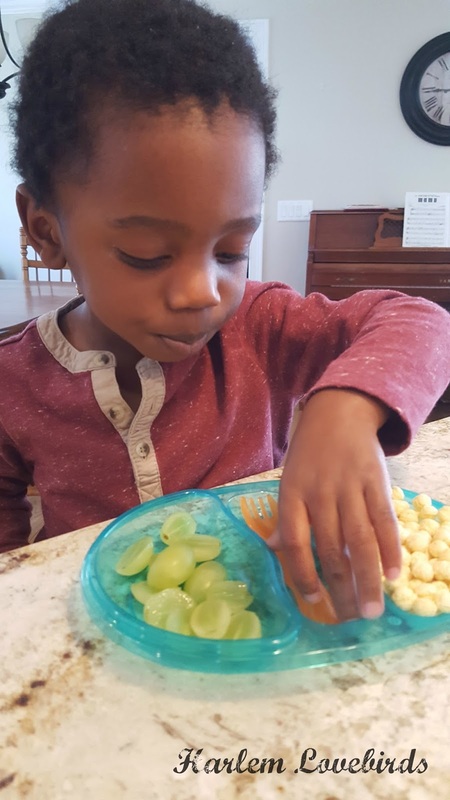 With Nia we found that seeing her peers eat various foods at preschool helped her try new foods, but with Grayson starting school this fall I've been trying to jumpstart the situation. When The First Years reached out to me to try their array of products now available at Walmart to help make snack time easier it was perfect timing! Grayson is the kind of kid that likes to be involved in food selection - if he picks things out at the grocery store he's more likely to eat them. Are your kids the same way? We've found some tasty and unique fruits we had never tried this way (remember this fruit?). We headed to the grocery store to pick up a few items in the produce section. I got Nia involved a bit too as she was curious about eggplant and while we had an interesting baked eggplant fries and dip recipe to try, it was a little soggy so we'll have to troubleshoot that for next time. Grayson * did* have fun using the eggplant as a ramp though as demonstrated in the GIF above! 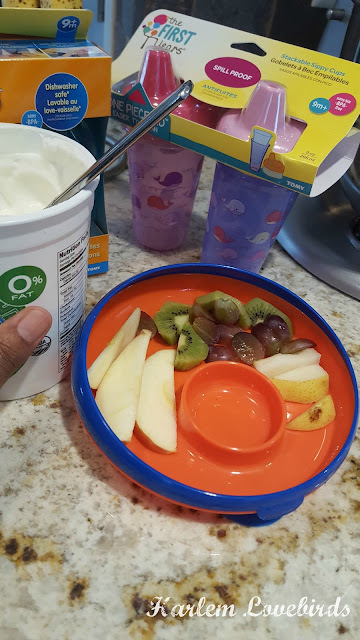 Instead I cut up an array of fruit for Grayson and made a simple Greek yogurt honey dip. 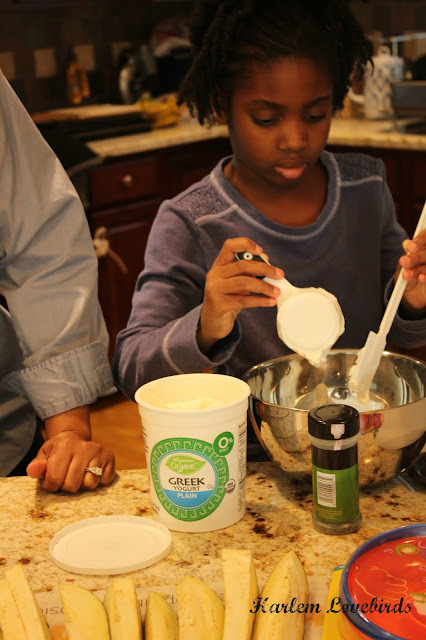 I've learned to give kids a variety of foods regularly and never grow weary of introducing the same food. It may take 5 or 6 "introductions" for kids to finally take to a food. This is what happened when I gave Grayson kiwi fruit as one of his fruits in his Inside Scoop Dip Plate. 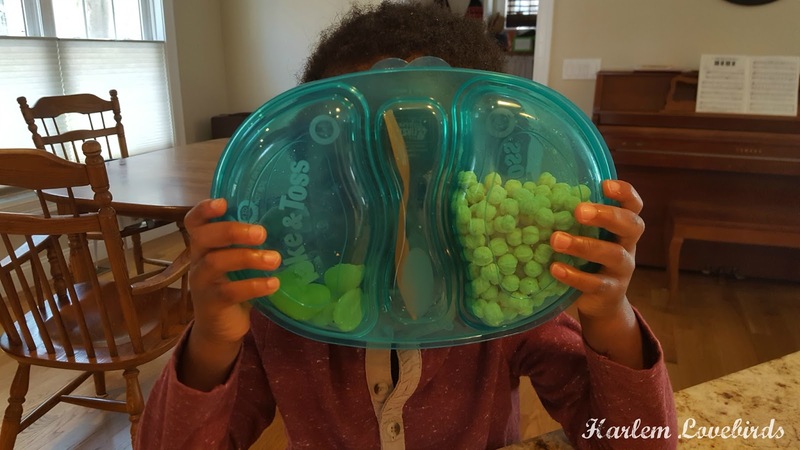 The rim helps toddlers guide their utensils to lessen spills and the suctions are great cause as we all know toddlers love to toss stuff! I was surprised to see Grayson finished all his kiwi but left his apples - something he usually eats. 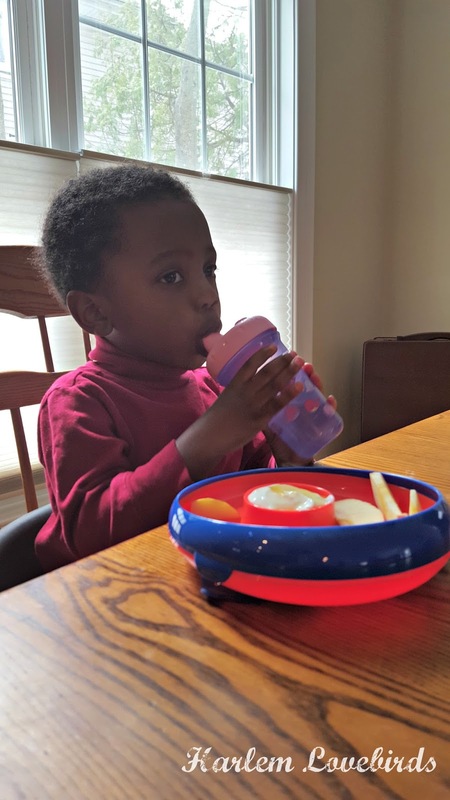 When it comes to staying hydrated Grayson is an awesome water drinker (he calls it "lolo" for some reason! 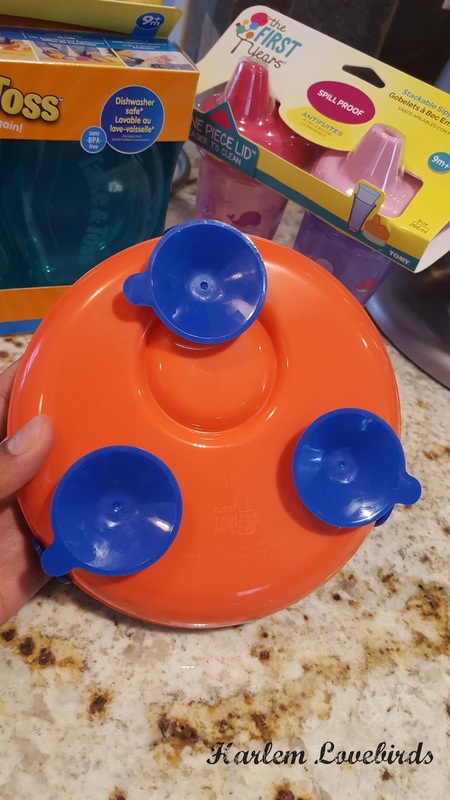 ), and since he likes pretty much anything his sister has including all her filly and princessy things, he was thrilled to receive spill-proof pink and purple Stackable Sippy Cups which have the signature One Piece Lid. I can't tell you how many times I lose the little parts so I was especially thankful for that feature. The First Years Double Duty Plate containers were the item I was most curious about! Grayson was especially thrilled at how all his snacks stayed in place, and I liked how much you could fit in them given how flat they are. There's a divider that keeps them from mixing and a section in the middle for a fork. Grayson asked for cereal and grapes in his and then needed refills - when we pack snacks for trips I usually have to keep it stealth otherwise they disappear before we hit the door. Low sugar, high fiber snacks are a must for all the energy Grayson needs - he's nonstop all day! 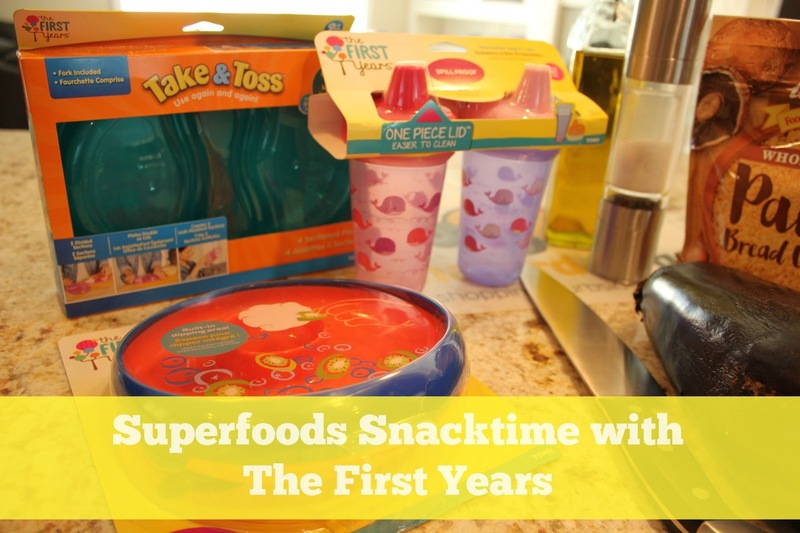 The First Years has so many options for all stages of childhood that are available at Walmart so be sure to check out their website for all their product offerings and follow on Facebook, Twitter and Instagram to stay on top of their latest news.